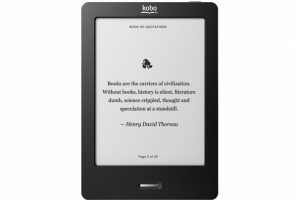 • You must set up your Kobo eReader before you can start using it. Before using your Kobo for the first time, you may have to charge it for up to four hours. Once your eReader is charged, you can set it up over a WiFi connection or by connecting it to your computer. If you have already completed the initial setup process, you may proceed to step 2. • Select the software for your Operating System (either Windows or Mac) and follow the steps onscreen. • During the installation process, you will be prompted to enter an Adobe ID to activate the software. If you already have an Adobe ID, enter your Adobe ID and password. If you do not have one, select Register at Adobe.com and create an account. After registering, return to ADE and enter your new Adobe ID and password. • ADE should now be installed on your computer and ready to use. • Click sign in in the upper right-hand corner. Select Cape Breton Regional Library from the drop-down menu and enter your library card barcode number and PIN (the last 4 digits of the primary phone number associated with your library account). • You can find books by entering the title, author, and/or keyword in the search box in the upper right-hand corner, or you can browse by subject or collection using the menu at the top of the page. • To check out a title, tap Borrow. If an item is checked out by someone else, tap Place a hold to receive an e-mail notification when it becomes available. • After tapping Borrow, you will see a pop-up banner that says: “This title is now checked out to you. See options for the title on your Loans page.” Tap the underlined word Loans to go to your Loans page. • Next, select click Download. The eBook file may appear at the bottom left-hand corner of the browser window, or a dialog box may open up and ask whether you want to open or save the file. Click on the file in the bottom left-hand corner of the browser to open it, or choose Open to open the file with Adobe Digital Editions. • ADE will open automatically and your eBook should appear in Reading View. Click Library in the upper left-hand corner to switch to Library View. In Library View, you can transfer eBooks from your computer to your eReader. • Connect your eReader to your computer. The eReader’s screen will display a message asking if you want to Cancel/Keep Reading or Connect/Manage Library. Select Connect or Manage Library. side of the screen. You may now disconnect your eReader from your computer and start reading! •You may have up to ten eBooks checked out at the same time. •The eBooks you check out will automatically expire on the due date, so there’s no need to worry about late fines. You may also return eBooks early. Open ADE in Library View and right-click on the icon of the eBook. Click Return Borrowed Item to return the eBook to the library and remove it from your computer.